A gorgeous home in Graduate Hospital you absolutely need to see! 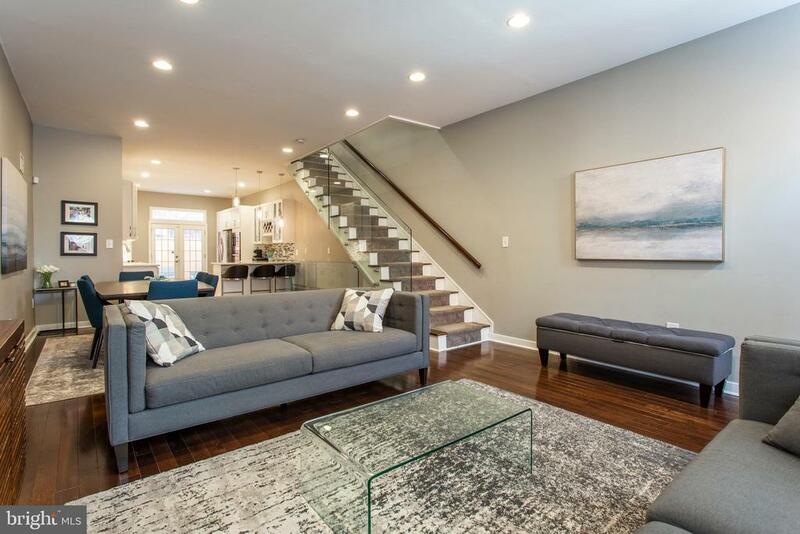 Rehabbed just 2 years ago, enter this energy efficient, deeper than normal home and admire the fabulous features throughout such as high ceilings, recessed lighting, extra wide stairs with glass railings, and gorgeous hardwood flooring. The open living and dining room floor plan accommodates any furniture arrangement, and naturally leads to the gourmet kitchen, complete with stainless steel appliances, wall oven, under cabinet lighting, wine rack, lovely pendant lighting, built-in pantry, beautiful quartz counters and tiled backsplash. The kitchen also includes access to an unbelievable rear yard with luscious ivy that grows in the summertime- just the spot for entertaining on those warm weather afternoons! Upstairs, the second floor reveals three spacious, light filled bedrooms with ample closet space and a conveniently located hall bath with a custom tiled shower and tub. Continue upstairs and discover the immense third floor master suite, which includes an extra space that can be used for a study or lounge area, a large walk-in closet and a master bathroom that is sure to please with its stylish dual vanity, tiled flooring and a large, custom tiled shower with jet spray system and frameless glass enclosure. For those who are still looking for extra indoor space, the finished carpeted basement is ready and waiting to become a rec room or home theater! The basement also includes a laundry area with quartz counters and bar sink, and a full bathroom with a tiled shower and glass enclosure for your comfort and convenience. The home also includes full blown insulation throughout, is fully wired with HDMI and ethernet, and features an alarm system with keypad and sensors on the windows for your peace of mind. Found in one of the city~s most desirable neighborhoods, the home is within easy walking distance of fantastic restaurants, shopping such as Target and Sprouts, some of the best daycares in the city and more! All of this, along with a year of prepaid parking? What are you waiting for, see this home today!